Platinum SEO Services - Dallas SEO Experts: Are You Ready For Google’s “Mobilepocalypse” Update on April 21st? The Official Channel for platinumseoservices.com on Blogger. Catch up with the latest things happening with the SEO experts at Platinum SEO Services. 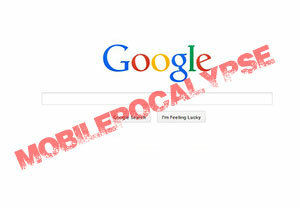 Are You Ready For Google’s “Mobilepocalypse” Update on April 21st? Unless you’ve been hiding deep underground or spending some quality time in a Tibetan monastery, you’ve likely heard rumblings about a coming update from Google, but do you understand what it is and more importantly, are you ready for it? Are you absolutely sure? Here’s a link to Google’s own announcement about this coming mobile focused update. The bottom line here is that Google has been pushing webmasters to make their sites “mobile friendly” for a while now and now they are going to push A LOT harder. When this update goes live on April 21st, sites that “G” sees as “mobile friendly” will get a pretty heft boost in rankings for users that are searching on a mobile device. What’s that I hear you saying? “Well, ok, but if it’s only for people searching on a mobile device, how much can that really hurt us if we’re not mobile friendly?”. Good question…and I’ll give you a simple answer…a LOT! Google has estimated that approximately 50% of it’s users are now using mobile devices. Read that again…on average HALF of their users are on mobile devices…and that is only going to increase. Couple that with the fact that, in the U.S., Google accounts for around 70% of the search traffic losing out on that mobile traffic could easily break many businesses. On sites we work with, I’ve been seeing closer to 40%, but still, and some niches will likely have even less, but even at 40% or 30% that is a LOT of potential traffic lost if your site is deemed as not mobile friendly. So, how can you tell if your site is mobile friendly? Well there are a couple of ways. First you can visit your site on your mobile phone. Does it reformat nicely for your screen so that everything is easy to get to? Does your menu reformat so that links aren’t too close together? If so, it’s likely you are mobile friendly, but again, the important thing is that GOOGLE thinks you are mobile friendly. Check out the graphic to the right. Do you see how some of the results show a little “mobile friendly” tag and some don’t. Well that is Google telling you which sites it sees as mobile friendly. You can bet after April 21st, those sites that don’t have the mobile friendly tag are going to be MUCH farther down in the rankings. 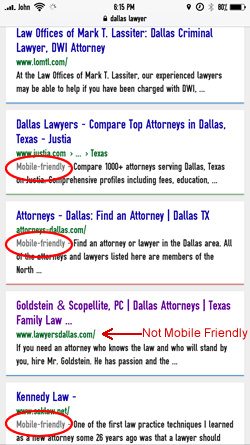 So, how can you tell if Google thinks your site is mobile friendly? Well, Google has been kind enough to provide webmasters with a tool that will analyze any URL and tell you if it sees it as mobile friendly. Remember, Google looks at each page of your site so one page could be seen as mobile friendly and another not. Any page that is seen as not mobile friendly will get pushed down in the results in favor of mobile friendly pages after April 21st. I urge you to go and test your site now, or contact us and we’ll test it for you, jut find out and if it isn’t mobile friendly that is something you need to address ASAP. Luckily, we can help. Platinum SEO Services is a Dallas SEO Company with a ton of experience in updating and reworking sites to make them search engine friendly. We also have a lot of options for business owners that are now needing to make their site mobile friendly. Not only is being mobile friendly now massively important to your site’s rankings, it’s just good business. As more and more users browse the web via mobile devices, your site should adjust to give them the best possible experience. The better and easier they can navigate your site, the better your chances are of converting them into a customer. That is the bottom line right…more customers? So get to it, go check your self at the URL above, or give us a call today at 972-544-6820 to see what we can do for you. Oh…did I mention we are pretty good at ranking sites as well? Yeah…we’re sort of SEO Experts so we could probably help you with that little issue while we’re at it! Platinum SEO Services. Awesome Inc. theme. Powered by Blogger.